Thought Engineering (TE) helps individuals to redesign their own thinking patterns in the mind to maximise their creative skills. Real life thought engineering is in many ways different from educational (physical) engineering, because it deals with the thinking process of brains. However, most scientists have learnt and believe that re-engineering the thought process can change the level of human productivity. The TDF model helps learners to understand the process of thinking, and create productive thoughts to maximise their future potentials. Thinking is a reasoning activity that an individual uses to process information, solve problems, make decisions, and to create new ideas. People make use of thinking skills when they make an effort to organise information, make connections among variables, ask questions, answer questions, make plans, and take decisions. Thinking is uncomfortable and stressful. Hence, many persons would like to work in areas where no thinking is necessary. However, in the modern business world, all operations where no thinking skills are necessary have been automated or replaced by machines. Hence, thinkers in the industry have become flyers (well-paid managers) while others are replaced by machines – or led to the position of unemployment, in the future. TDF stands for Thinking, Doing and Finishing. These are the three major pillars on which the quality of learners is grown and moulded. 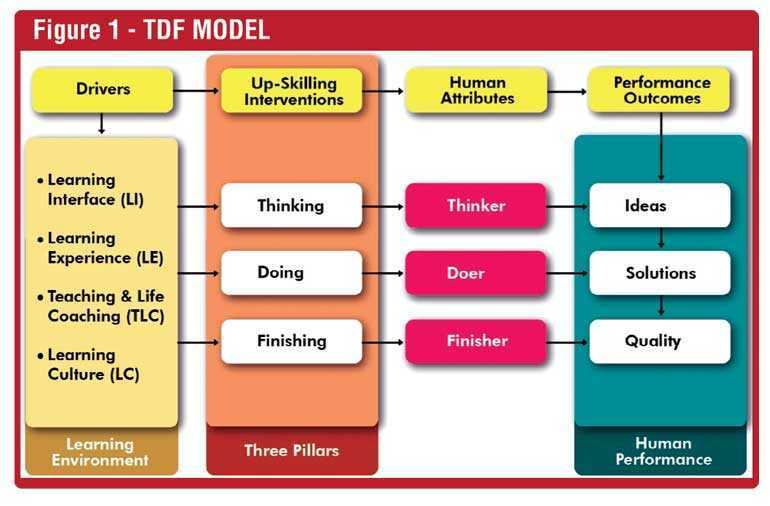 In keeping with the changing industry needs in mind, the TDF model has developed and evolved its teaching strategy around three major skills/ attributes so that its learners will end up acquiring three major skills critical in building their future prospects. In simple terms, a learner plays three key roles at the end of the process as a Thinker, a Doer and a great Finisher. Thinking is defined as the process of reasoning about something. Output of the thinking process is a thought. Simply put, a thought is an idea or an opinion occurring in the mind. The human brain is composed of about 100 billion nerve cells (neurons) interconnected by trillions of connections, called synapses. On average, each connection transmits about one signal per second. Some specialised connections send up to 1,000 signals per second. Somehow these transmissions produce thoughts in the mind, says MIT McGovern Institute for Brain Research Neurotechnology Director Charles Jennings. To be a thinker, one needs the power to create: in order to be creative, an individual should have the ability to perceive things in new ways or relate things or ideas which were previously unrelated. Simply put, creativity is the ability to look where everyone else is looking and see what no one else can see. This occurs in the minds through a thought-provoking process, such as flexibility, tolerance of uncertainty or unpredictability, and testing of hypotheses to answer the unknown, until a feasible solution is created. It is a thinker who is capable enough to test all possible assumptions to make productive ideas. Doing refers to the act of performing or executing. Outputs are result of operationalising the process. Thoughts and new ideas are converted into real products and services through designing or improving a new process. In other words, a new product stems from a new process. Hence, doing or execution is directly related to innovation of a process, and operationalising the same. To be a Doer, one needs the ability to innovate: the process of bringing new ideas to life is called innovation. It is simply a process of creating greater value for which customers are willing to pay, as it satisfies a specific want. Innovation involves deliberate application of knowledge, visualisation and initiative in deriving greater or different values from resources, and includes all processes by which new ideas are converted into worthwhile products. In business, innovation often results when the company applies ideas in order to further satisfy the needs and expectations of its customers. Innovation demands technical and operational skills to see the realities of the ground or the shop floor (Gemba). Finishing everything initiated is a great habit of Finishers. Experiments can be permanently extracted if the hypothesis is rejected based on the facts; however, all other projects and commitments should be started and finished with the end in mind. This is called the entrepreneur mindset. Finishers should always keep in their minds that finishing has to be done with the right quality as well. To be a great Finisher, one needs the technical skills to design quality: quality is about making products and services that are designed considering the expectations of their users. Quality has to be built in and has to be sourced from the design itself. Quality cannot be checked and controlled. It has to be assured in the process of making the product from design to delivery. A great finisher starts things with the end in mind and provides near – perfect (Six Sigma Quality) products and services for its end users.